The HTC One max is HTC's answer to an ever-increasing trend to release smartphones with super-sized screens, taking on the Samsung Galaxy Note 3 and the Sony Xperia Z Ultra. As flagship smartphones like the LG G2 and the Sony Xperia Z1 have proven, screen sizes appear to be increasing across the board, in turn this has resulted in the large feature phones also receiving a bump in the display department. Whereas before the original Samsung Galaxy Note featured a 5.3-inch display, the Samsung Galaxy Note 3 now features a sizable 5.7-inch Full HD display whilst the Sony Xperia Z Ultra takes it even further sporting a massive 6.4-inch Full HD screen. While it's clear that there's definitely increasing demand for these phones, the added size does come with some added complications, practicality now becomes an issue - something Samsung immediately dealt with by giving the original Galaxy Note a stylus - while battery life and portability also become essential elements of these devices. HTC, of course, is no stranger to launching large-screen phones with the HTC One X arguably being one of the first to start this trend, which then asks the question, has HTC taken what it's learnt and translated it to the One Max? The One Max isn't just HTC's largest smartphone it's also one of the largest smartphones available on the market, with a 5.9-inch Full-HD display there's a lot of real-estate which means there's the potential for a lot of bulk. The aluminium build from the HTC One is carried over while the white plastic bordering that featured in the HTC One Mini is also present, there's also a removable back, though sadly this is only to gain access to the SIM card and Micro SD slot as the battery is non-removeable. Whereas the HTC One and One Mini gained plus points for their reassuring bulk over the competition it unfortunately doesn't carry over well into the big phone arena, at 217g this is by far one of the heaviest phones we've encountered. At 10.29mm it's also nowhere near the thinnest being only 0.02mm thinner than the Nokia Lumia 1020 and seems positively brick-like when put next to the Xperia Z Ultra which clocks in at 6.5mm. If there is one thing to be said of HTC though it's that the build quality has remained excellent throughout the entire range, despite any dimensional shortcomings the One Max is fantasitcally well put together, it is a state-of-the-art piece of technology and its design reflects that. One of the first things you'll notice when you pick up the One Max is the mysterious grey box located on the back of the smartphone, that grey box is a fingerprint scanner, a feature that it shares with only one other smartphone, the iPhone 5s. The scanner placement follows the same reasoning of thought that made LG put the buttons of the back of the LG G2 - the fingers are naturally resting on the back of the phone anyway so why not place features there. The One Max will recognise up to three fingerprints, these can then be assigned to either unlocking the phone or starting a key number of applications. In practise we found the process to be a little sluggish, while the setup is arguably much easier than that on the iPhone - you only need to swipe four times - this does however mean there's little room for error so you have to swipe the whole of the fingerprint across the reader otherwise it simply won't recognise it. This becomes frustrating when you're in a rush and downright infuriating if you're trying to unlock it one-handed. While we commend HTC for implementing a technology that absolutely should be heading to smartphones we're not so sure whether this first outing has worked 100 per cent. The One Max also comes with HTC's new Sense 5.5 UI which on the surface looks identical to the previous version, but what it does bring is a much-needed update to BlinkFeed adding even more customisation and allowing you to integrate with Instagram and Google+. Thanks to the large screen on the One max the new BlinkFeed looks fantastic and we can't wait to see it implemented on the HTC One and the HTC One mini. The One max features a 5.9-inch Full-HD display and while HTC won't give us any more info on the panel the results are suitably impressive. Bright and crystal clear it's one of HTCs best displays yet, colours are bright and vibrant while whites stand out perfectly. Saved photos are arguably enhanced by the larger display and videos jump out of the screen aided by the dual BoomSound speakers. 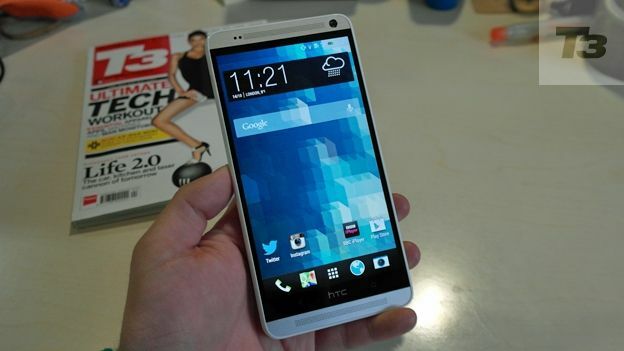 Joining the HTC One and the HTC One Mini, the One Max features HTC's UltraPixel 4MP sensor. For those that are pondering the low number that's because HTC has used lower pixels on a much larger sensor, the results being that you have improved low light performance and better colour reproduction. We're happy to say the excellent performance from the previous two smartphones has carried over with the One Max producing some great images. Low light performance can be a little grainy however close-ups looks fantastic. The One Max comes with a Snapdragon 600 1.7GHz Quad-core processor and 2GB RAM, while these numbers may seem low in comparison to say the Galaxy Note 3 or the Xperia Z Ultra in truth you won't notice the difference. Utterly smooth in its operation the One Max feels as fast as you'd expect a flagship phone to feel with high-performance apps and games running without a hitch. For those who like their storage the One Max comes in either a 16GB or 32GB variant with the ability to add up to 64GB via the micro SD slot, if that's not enough you'll also get an additional 50GB of Google Drive storage free. There's a large embedded 3,300mAh battery with the option to buy a Power Flip Case which adds 1,150mAh giving you more than enough power in total to get through a day and an evening. On its own though we found that the One Max was entirely on par with the other range of flagship smartphones you encounter today, this means you should be able to get a full day's usage without the juice running out, however turn up the screen brightness and you'll start noticing a sharp decrease in battery life. HTC has a strong foundation upon which to build upon with the max, both the One and the One Mini are excellent smartphones with the One being crowned as T3's Phone of the Year at the T3 Gadget Awards 2013. The problem we have here though is that HTC has played it safe, transferring almost all of the features from the HTC One into a 5.9-inch smartphone, and while on paper that may sound attractive it just doesn't translate well into reality. Bulk may have worked for its siblings but in this case the Max feels too bulky, add to this the fact that some apps (Twitter, Instagram and Facebook) seem to just be bigger rather than contextually fitting more info on the screen and the larger screen feels underused. The fingerprint scanner is something we applaud, and we can definitely see this technology heading to more smartphones in the future, and while it's not the ultra-slick operation you'll find on the iPhone 5s it's definitely a start. Thankfully there is a considerable amount to like about the Max, for starters that huge 5.9-inch display, it really is HTCs best panel yet, mostly thanks to its brightness but also because of its overall performance. BlinkFeed has also been hugely improved, and it shines through on such a large screen, we look forward to it being implemented on both the One and the One mini. The question isn't whether you'd choose this over the One or the One mini though, it's whether it can stand up to the likes of the Galaxy Note 3 or the Xperia Z Ultra and in truth we can't see a clear reason to buy it over either of those. It's not that the One max is a bad phone, in fact all of the specs on the One Max are impressive and they perform incredibly well, but ultimately it's the way in which you package these that counts and in this instance the Max just isn't practical. Whereas the Note 3 offers added functionality with the S-Pen and the Xperia Z Ultra has its slim profile and waterproofing we unfortunately can't see why you'd choose the One max over either of these.